Burnley go to Bournemouth still embroiled in a relation battle, but displaying form of those battling for the Champions League slots. And Sean Dyche is hoping to build on an impressive second half of the season to ensure their Premier League safety. A win at the Vitality Stadium on Saturday will move Burnley within two points of the Cherries, who start the day in 12th, and would push the Clarets eight points clear of Cardiff in the last relegation spot. Dyche’s side have enjoyed a remarkable turnaround since Boxing Day, when they sat in the bottom three with 12 points from 19 games. They have since won 21 from 13, to put themselves in a more favourable position. And that return is better than that of third place Spurs, who have taken 19 in that time, and only two less than Chelsea in fifth. 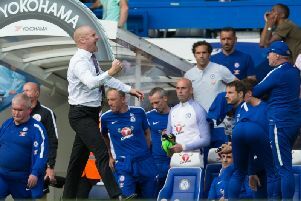 Dyche said, of the carrot of beating Eddie Howe’s side: “That’s not the incentive, but, I think the league has been like that. “The top six have been the top six, there are Watford, Wolves, Leicester, Everton who have kept it going, West Ham have been in and out, but there have been three leagues this year. “Three points makes it look radically different, every time you look. “That’s how powerful three points are in the Premier League. “The end is the bit you’re judged by, we debate it all season, but when that final whistle blows, that’s the real judgement, when what you’ve done, you’ve done. “I think because of the challenges, the ups and downs and ins and outs, it will certainly be a very good achievement (staying up). “Since the turnaround at Christmas, the players deserve a lot of credit. “I did speak before of the pride I have in the players, what they do, because people forget what a lot of these players have done, they have done a lot for this club, and I haven’t forgotten that. “Now enhances that feeling, because we have been winning, but it was there when we weren’t, I was saying I have complete faith and pride in these players and what they have and continue to achieve. “I’m pleased to say they are now repaying that thought back, for themselves, the team and for me, they’re saying ‘yeah, we get it’. “I goes to ‘you haven’t won in four’, but let’s have it right, you win the fifth, and look where it is factually, in front of Tottenham by the way in the last 13 games, just behind Chelsea, joint with Wolves who are being lauded, and rightly so, for their performances, and you go ‘hang on a minute’ you can’t have it all ways.